Anne Runyon has a long and passionate connection to Ocracoke Island. Her father, Charles, discovered this special place in the 1950s, and Anne's mother, Robbie, and Charles bought an historic home some years later. They made Ocracoke their permanent home at retirement. Anne spent many pleasant times visiting her parents here. 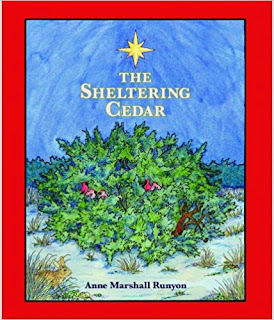 In 2007 Anne wrote a delightful holiday children's book, The Sheltering Cedar, based on her love of Ocracoke. A sturdy tree shelters small animals during a storm on Christmas Eve, allowing peace and joy to reign as the tempest clears. Filled with beautiful illustrations of birds, animals, water, and sky, The Sheltering Cedar is a gift of nature, illuminating and delightful. For ages 3-7. Eileen Heyes, author of the O'Dwyer and Grady mysteries reviewed the book: "To say The Sheltering Cedar is a lovely book doesn't do it justice. The spare, evocative text and warm, detailed watercolors bespeak Anne Runyon's love for Ocracoke Island. She knows this special place well, has studied its intricately balanced ecosystem with all her senses and now takes the rest of us there with all her heart. The quiet story of a coastal tree sheltering wildlife from a Christmas Eve storm will be bedtime favorite for toddlers, while the author's explanatory note and activities will make this a fun addition to school libraries and classrooms. Anne Marshall Runyon was born in Washington, DC. Quiet summers on Ocracoke Island nurtured a lifelong interest in the natural world. Anne studied printmaking at Carleton College, and design at the University of Minnesota. She and her family live in Garner, North Carolina. She belongs to the Guild of Natural Science Illustrators and the Society of Children's Book Writers and Illustrators. Anne writes and illustrates articles for WILD Notebook, and the children's section of Wildlife in North Carolina magazine. Ms. Runyon's artwork is also featured throughout North Carolina, in many conservation publications, and in permanent environmental education exhibits.